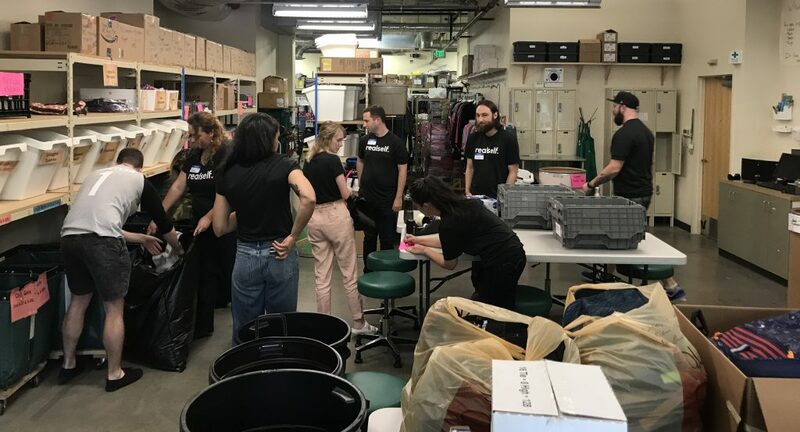 RealSelf employees recently put their sorting, folding, packing, and tagging skills to the test during an afternoon volunteering in the Treehouse warehouse. Treehouse’s mission is to bring equity for youth in foster care. That includes providing the kids with the academic support they need to graduate from high school at the same rate as their peers. The impact of the effort has been significant. Washington youth in foster care who aren’t in the Treehouse program have a 5-year high school graduation rate of 49%. The rate for those in the program jumps to 89% — above the Washington state average rate of 82%. A huge part of the effort is an annual back-to-school drive that helps supply youth in the program with the supplies they need to feel confident in school. That is where RealSelf came in. In July, RealSelf employees participated in a back-to-school drive for Treehouse, donating clothing and school supplies. 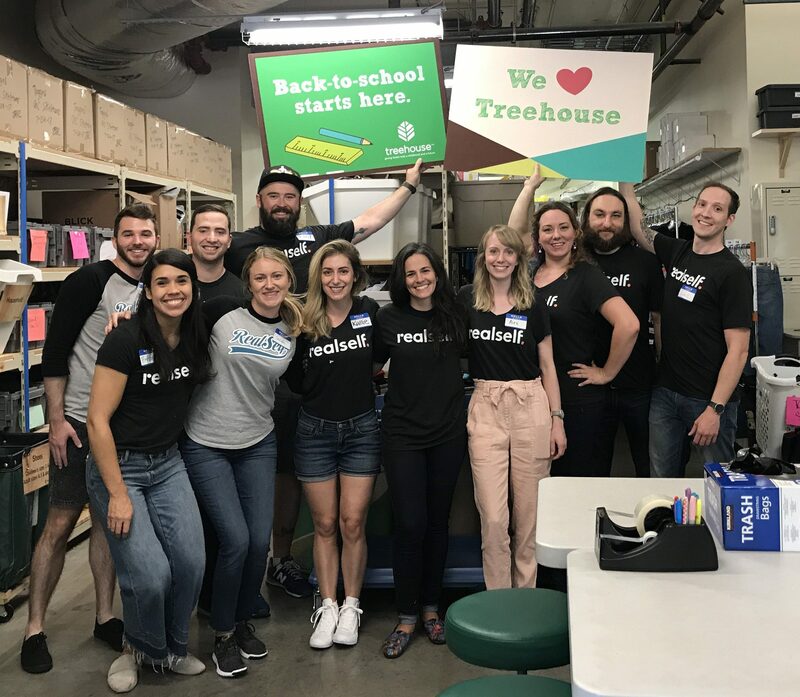 We wanted to make an even bigger impact, so we partnered with Treehouse on a volunteer day in the warehouse. Treehouse receives thousands of donations ranging from new school supplies to used clothing, and everything in between. Each item has to be checked for quality, sorted, and processed before it hits the floor of the Treehouse store where the kids shop. Nearly a dozen RealSelf employees spent an afternoon doing just that. From separating pencils and pens to processing bags and bags of clothing, we did a little bit of everything. The majority of the day was spent in the Treehouse warehouse, but we also spent some time stocking the the store floor while several kids were busy shopping. Treehouse received so many school supply donations we were running out of bins to store them all in. We were also put on duty of sorting more than 100 donated backpacks and dozens and dozens of new clothing items. Everything donated to Treehouse gets put to use. If it’s not up to the standard of what the kids would receive, then it is donated to Goodwill in exchange for vouchers Treehouse uses to purchase additional inventory. Processing all of the items is a major effort, and volunteer teams are a big help. 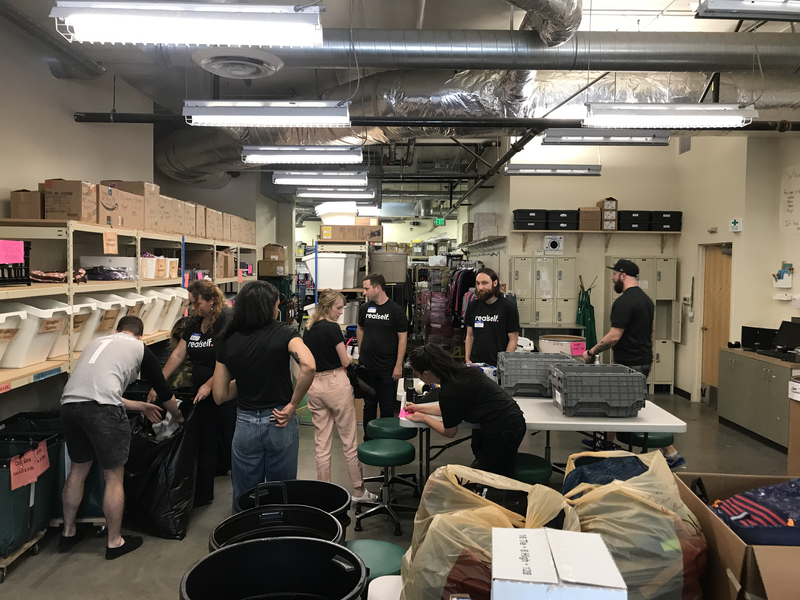 This wasn’t the first time RealSelf partnered with Treehouse and that partnership will continue in the future with more clothing drives and volunteer opportunities.